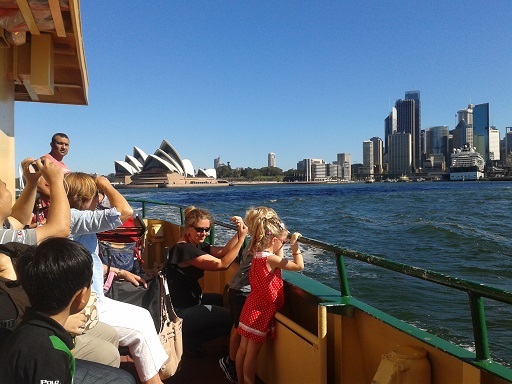 Filial Piety @ Aurora Australis (Part II) : The Iconic Emblems of Sydney – The Harbour Bridge & The Opera House! 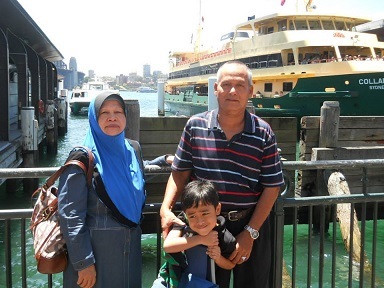 Our first destination in Sydney was to visit Circular Quay. 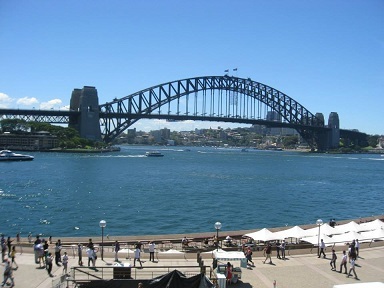 It is a harbour that can be dubbed as the pulse of Sydney life; with a few tourism attractions situated nearby. It is approximately 13 km from Campsie and is reachable via Sydney Train Line. We walked 700 meter to the Campsie station; bought our MyMulti cards and off we went! 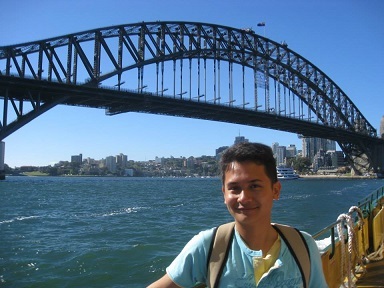 Alhamdulillah; finally I saw Opera House & Harbour Bridge with my own eyes! Life is beautiful, Subhanallah! Circa 1.30 p.m., we arrived at Circular Quay. It was very lay-back and the ambiance is like Penang! I guess it’s because of the by-the-sea element. People were thronging along the alley and you can see a few performers doing their artsy performances by the street. There were people playing trumpets, playing flutes and a few of Aborigine people playing their instruments. It was really a great commotion! We walked around and took some pictures. The sun was scorching hot but the wind was cooling – how irony is that? 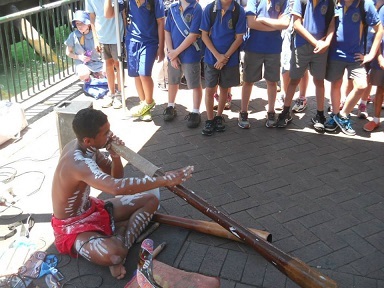 The Aussie Aborigine performer playing the famous instrument, didgeridoo. Mak, Ayah & Rifqi (I know, he is already 7 years old!). Look at the beautiful sea. I read in Aquarium (in the next entry!) 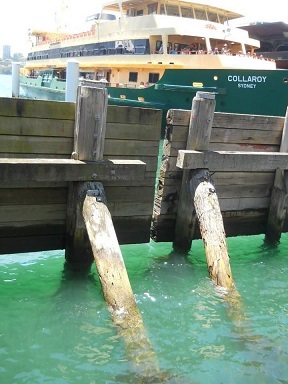 that Sydney really takes care of the cleanliness to maintain the beauty of it; apart from to secure it as sanctuaries for marine creatures. 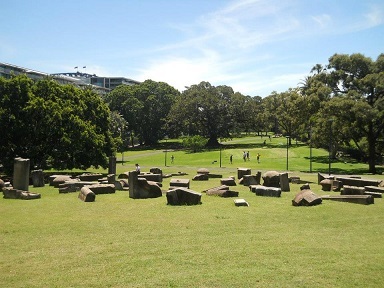 We had lunch at The Royal Botanic Garden Sydney which is a vast field with a few peculiar looking stones like some of ruins. Apparently as I did my reading on Internet regarding The Royal Botanic Garden Sydney, it is adjoined with The Domain, Sydney. We could see people hanging out there; just to get themselves tanned. We, on the other had, feasted on our luncheon packed from home – rice, of course – with a few Asian delicacies (courtesy of Kakak’s Brahmin packed stuffs; Hahaha!) and bananas! 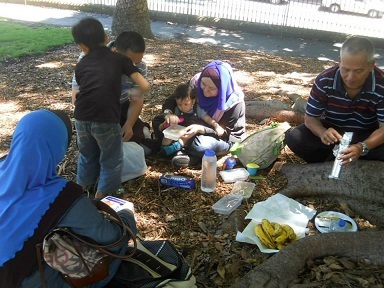 It was really nice and peaceful picnic. What do you expect? We are economical/budget travelers and we are certainly the typical Asian family! So..rice, it is! Hahaha! 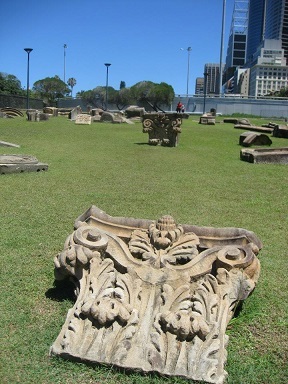 The ever peaceful Sydney’s Royal Botanic Garden; or The Domain (which one?). 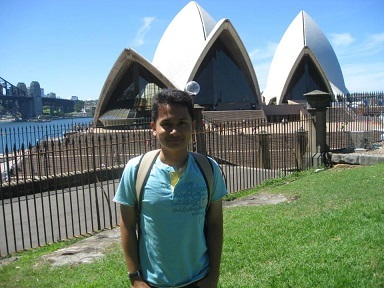 Then, off we walked to see the majestic iconic building of Australia – The Opera House and Sydney Bridge! My, my… I have to say it was ethereal feeling to walk along the The Domain Sydney/Royal Botanic Garden and seeing the Sydney Bridge lied in front of my eyes with its the majestic structure! Can hardly believe that it was built in 1932! And opposite it is of course, the Opera House! 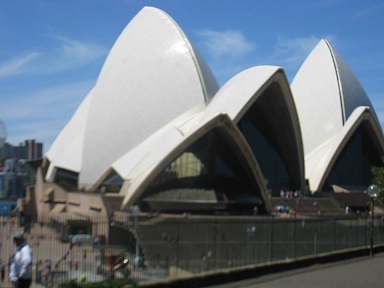 According to Wikipedia (http://en.wikipedia.org/wiki/Sydney_Opera_House); it was opened in 1973 with the cost tantamount to $102 million! The shell/coral-like structure is a unique and one-of-a-kind feature. 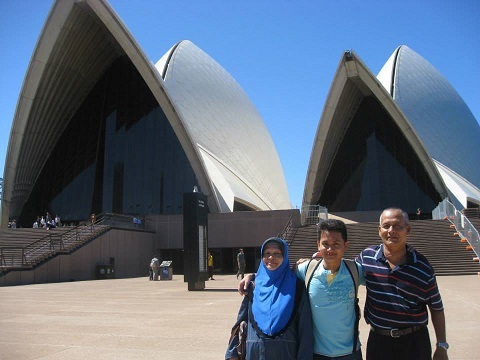 I felt sense of relieved and satisfaction of being able to bring Mak & Ayah to see the Opera House with their own eyes. Such a great feeling. My pride! I finally brought them there! Alhamdulillah! 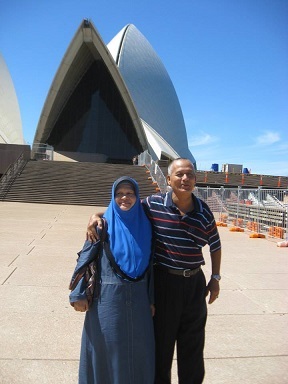 Ayah & Mak’s rare “getting cozy” picture – after being taunted by Kakak! Hahaha! We then performed prayer at a secluded place in the Opera House; Kakak, Mak & Abang Zam performed under a deserted staircase whilst Rifqi, Ayah & I performed in front of a gate which we thought deserted but then suddenly there was an entourage coming in!!! So, what was my reaction? I just said – “Sorry” in a loud visible tone as per how Westerners always put it (you know, we Asians always put the soft and timid tone when we talk? I imitated when I was there because that is the culture); but the tourist guide was quite understanding – “No, that’s all right!”. So… that was an experience to be shared! Hahaha! 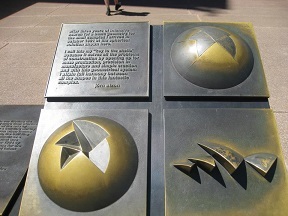 The plaque/memorial-explanation-stone pertaining Opera House’s history. 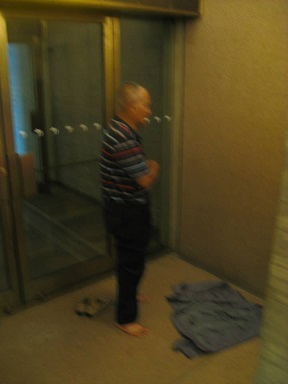 Where we performed our prayer! 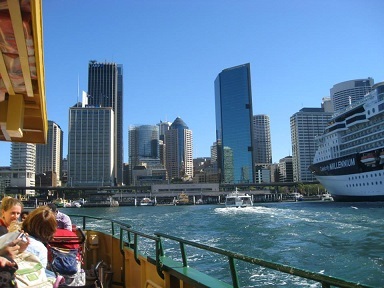 After prayers, we then boarded the ferry across to Darling Harbour. It was very nice to see Sydney while crossing the sea. The sea-breeze was very cooling and of course, I didn’t let the chance to snap as many photos as I could – to the extend of asking one white Aussie woman to take photos for me (Well, I do that a lot of time! Hahahaha!). 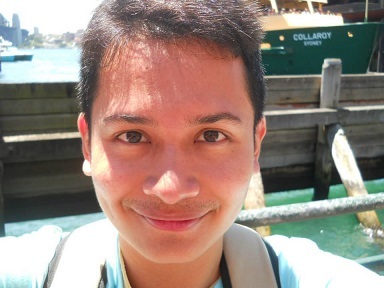 We strolled along Darling Harbour; watching people dining and led a casual lifestyle; it’s very Penangite life! Seeing mischievous seagulls perching and trying to get the food from us was somewhat therapeutic. 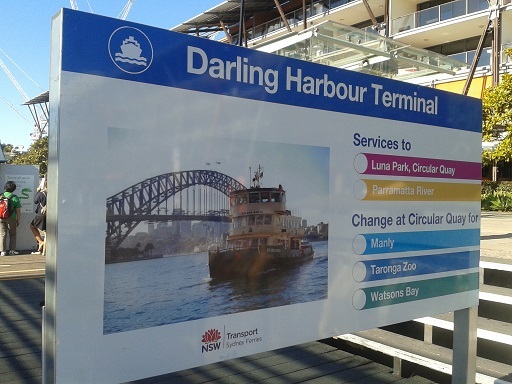 Boarding ferry to Darling Harbour though they can be reached by walking; since it is in Circular Quay! On the ferry to Darling Harbour. 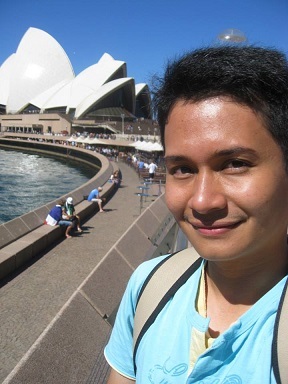 My 29 years old in Circular Quay, Sydney – Australia! 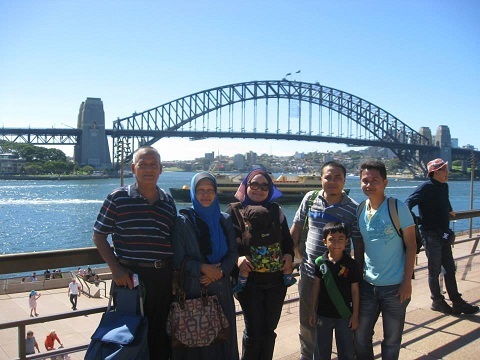 ← Filial Piety @ Aurora Australis (Part I) : Campsie Street, Sydney Suburb. Always fun seeing pictures and read your blog. It is always nice reading and seeing your blog. Fun!